The Moy system accounted for a reported catch of 83 salmon for the week. With high water levels fishing conditions remained difficult for most of the week. The weekend saw the best of the action mainly in the middle and upper regions. Jason Cullen, Offaly, had an eight pounder on Gannon's, while Ger Dolan, also Offaly, landed a 10 lbs. salmon on Rinnaney. Both fish were caught on worm. The Foxford Fishery produced an 8 lbs. salmon for David Bradley from Northern Ireland. Up river on Cloongee, successful anglers included Jean-Louis Coupe, France, with a 6 lbs. salmon on spinner and Jez Leech, UK, who caught a 9 lbs. fish on worm. Anglers on the East Mayo section enjoyed good sport with a few double figure salmon landed. Mark Duncalf from Wales and Jacques Verchere, France, had a 12 pounder each (both on spinner), while German visitor, Walter Posselt caught a 10.5 lbs. salmon. The fists salmon of the 2015 fishing season was caught on the Owenmore River by Oisín O'Sullivan from Offaly. Oisín's 8 lbs. fish took an Ally's Shrimp and was carefully released to the water as the Owenmore River is a Catch & Release Fishery this season. Carrowmore Lake produced a total of 13 salmon (5 released) over just 3 days. The lake was only fishable from Thursday until Saturday due to the extremely windy conditions. John Campbell and his son, John Jnr., Northern Ireland, had 4 fish together (2 released), best at 8 lbs., while Pat Foley, Monaghan, caught another eight pounder. Most successful flies included Green Peter, Claret Dabbler and Clan Chief Muddler. 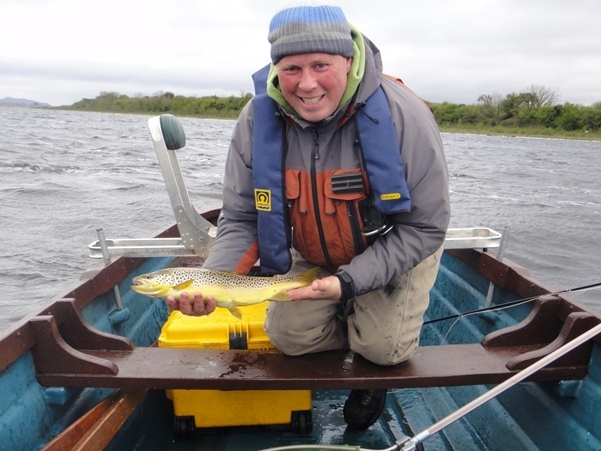 Anglers on Lough Beltra East enjoyed good sport over the past two weeks with some fine double figure salmon reported. The May Bank Holiday weekend saw the best of the action including a fantastic 16 lbs. salmon for Jonathan Murray. Richard McDowell had two fish at 8 lbs. and 7 lbs. (one released), while Dan O'Donovan boated a ten pounder. Other successful anglers included Maurice and Ken Livingston with a fish of 7 lbs. each and Dean Reid with a 10 lbs. salmon. Best flies included Green Peter, Silver Wilkinson and Reverend Mother. www.newporthouse.ie. To fish Lough Beltra East please visit www.loughbeltra.com. The past two weeks saw a continuation of the good fishing on the Ballisodare Fishery. However, the fishing was disrupted for a few days due to heavy rainfall resulting in high water levels. A total of 37 fish were reported for the two weeks including a cracking fish for flyangler John Murray weighing over 14 lbs. Worm and fly were the most productive methods and with almost 8 lbs. the average size was very good. Amongst the successful anglers were brothers Mark and Damien Crawford. Damien released a fish of 6 lbs. on the fly and caught a ten pounder on worm, while his brother Mark had a fine 12 lbs. fish also on worm. It's been another excellent week for trout anglers on Loughs Conn & Cullin despite the fact that the mayfly hatches, which started last week, are still a little sparse. On Conn, fish are still feeding on olives and buzzers with only a little mayfly action occurring in Castlehill Bay. Jon Walsh from Cloghans had some excellent fishing in his home bay with 7 super trout on Saturday last. Most fish were caught on Claret Dabblers and the best fish was around 3 lbs. All fish were returned. John Walsh with a fine 3 lbs. trout from Lough Conn.
At Gerry Murphy's Boat Hire, Massbrook, John Flanagan & Mick Sweeny, Loughrea, had 12 keepers over two days. Fishing mainly in the Massbrook and Victoria Bay area they had plenty of action with trout in a variety of sizes, mostly on wet mayfly patterns. Their best fish was a cracker of 3 lbs. Also in the Massbrook area last Friday, Sean Dively had 4 trout (all released) on a Green Dabbler, best fish at 1.5 lbs. Derek Lonergan & James Murphy, Kildare, fished around Victoria Bay and had 14 trout all on a variety of wet flies. Best fish at approx. 2.5 lbs. and, again, all trout were returned. Back to the east side of the lake and Brendan Breslin & Mick McNeeley, both Knockmore, had 11 trout (all released) last Saturday in the Brackwansha area. Conn regulars Steven Browne & Rory Harkin could only make it out onto the lake for two hours last Saturday. They headed to the nearby Cloghans Bay and had some frantic action with dry olives. Numerous fish were caught and released including 5 fish over 1.5 lbs. Harry McCaffrey from Ballina headed for his favourite drift on L. Conn last Thursday and was rewarded with 6 good trout as well as a number of smaller ones. His best fish was just over 2 lbs. caught on a Claret Dabbler. Connor Dowd and Sam Byrne, Galway, enjoyed a great day last Friday with 16 trout on dry olives, mainly in the Cloghans area, while Chris Flannery & Jack Connolly, Sligo, boated 13 trout on dry olives in Cloghans and Sandy Bay on Saturday. Local regular, Paul Caslin, had just one day on L. Cullin last week and fishing his "never fail" Ginger Dabbler had 4 good trout. Paul reported fairly good hatches of mayflies as well as a few olives and if the weather improves next week, fishing will probably hit its seasonal peak on Cullin. Bruce Vaughan, visiting from the UK, also had 4 decent fish on Cullin on dry mayfly patterns, while Richard Binley, Foxford, had 3 also on mayflies. Catherine McGoldrick with her first 2015 brown trout from Lough Arrow. Lough Arrow saw a very good week with excellent catches and a good average size. Among those to report catches in recent days were Luke O'Connell and John Murray with 8 trout (7 released) in one day; best at 2.5 lbs. Sarah Frazer was also successful with a fine 4 lbs. fish, while Catherine McGoldrick caught her first trout (1.75 lbs.) of the 2015 season. Both fish were caught on the dap. Lough Arrow Fish Preservation Association & District Anglers will hold their annual Mayfly Competition on Sunday 17th May from 10am until 6pm. Weigh in for single heaviest fish will be in the Bow & Arrow Pub, Ballindoon, at 7pm. Size limit is 13 inches (nose to fork of tail). Entries accepted between 9am and 10am at Flynn's Pier, or by texting your details before start time to Alison on 087 9541835, Karl on 086 8343584, David on 087 3825376 or Sarah on 087 9734101.